I purchased several of these for the office and kept one for my Net-book. The only complaints I received was about the size. They are smaller but after a month every one said they got used to them. They work great on any surface and the range is pretty good. They are a good buy for every day computer use, but I would not recommend these mice gaming. I buy it to replace my old Microsoft laser mouse 7000. So far, it works as good as if not better than the laser mouse. The size is about right, small enough to be portable and big enough to feel comfortable in your hand.I especially like the small transceiver which you could insert into an opening underneath the mouse when it's not in use. Unlike that of the laser mouse which is as big as a USB drive.It also has an on-off switch, so u could save battery juice by turning off the mouse when you don't need it. A very useful feature that's absent from the laser mouse 7000. Pros: - Small, compact, reasonably comfortable- Buying a 2nd one to replace the one that lasted through daily work-use for over 2 years. Overall this is an outstanding work-mouse. Very portable and fits easily in little crevices of my work bag, battery life is quite good, tracks decently on glass, and fits my hand very well (I prefer a palm grip over a claw grip). Cons: Feels like it would easily break if you drop it. Pros: Cheap, great wireless mouse. I have a white one, similar to this mouse 4000 Studios Series and so far it's been great. The battery lasts a long time as well. Pros: smooth, light, tiny transmitter/ receiver, good size for portable or regular use (slightly smaller than regular mice). works on lots of surfaces. Great mouse. Nice shape, style & size for ambidextrous use. Slightly smaller than regular size but not one of those real tiny mice. Good size for portable use. 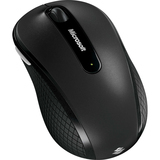 Previously used Logitech mouseman optical (part of wireless keyboard & mouse) for years. Great little mouse for carrying around with your laptop. It is truly meant for portable notebooks.One thing I never thought of when I bought this mouse was the materials, and I'll say that the snake skin looking rubberized sides are just awesome. it really does feel like you have a good grip on the mouse when using it.I don't know what this blue track technology is but this mouse will properly track on multiple random surfaces like bedsheets, carpet, reflective surfaces, etc.I'm only giving it a 4 out of 5 cause I a person that needs to sense what's going on and if I can't feel the scroll wheel clicks, it drives me nuts. But that's just personal preference. Flip 3D in Windows 7: Easily switch between open windows with the click of a button.